Starting from behind is a position no team wants to find itself in. Momentum is huge, particularly in the everything-has-a-cost game of rally-point volleyball, and the Bulldog netters were coming off of a match that had illustrated that in painful clarity. The ‘Dogs fell Tuesday to Goddard in five games after leading the Rockets 2-0, and as Roswell High took a 25-21 win from Artesia in the opening set Thursday at Bulldog Pit, the tension was high. But the girls in orange have proven themselves more than capable this season of responding under pressure, and they did just that, rebounding to win three straight for a 3-1 victory over a Coyote team they edged in five Oct. 11. Down 3-1 early in Game Two, the ‘Dogs finally began to find their rhythm, taking a 5-3 lead on a trio from service by Kyrah Gonzales, then slowly chipping away on a kill here by Mattie McCombs, Stacia Martinez and Dezaray Boyce or an ace there from Alexa Riggs. Trailing 17-14 late, the Coyotes were able to tie the game at 18, but two points from Kamryn Esquibel put Artesia back in front and three from Martinez – including an ace and kills by Boyce and Gracie Puentes – brought about game point. And following a side-out, a hard slam to the court by Puentes tied the match, 25-23. Again working from behind in the early stages of the third set, the ‘Dogs bounded out in front with help from a pair of McCombs aces, 6-4, and settled in from there. Two apiece from Esquibel and Riggs helped make it 13-9 in Artesia’s favor, and three straight kills by Puentes put the Bulldogs up 18-14. Boyce slammed home two kills of her own in the latter stages, one to end a Roswell run that had brought the Coyotes back within three, 21-18, and Gonzales served out the game, setting over the final point, 25-18. Riggs got the ‘Dogs started with two service points in Game Four while Boyce went on a literal tear, hammering home three points that, followed by a pair of Kaci Thurman aces, made it 6-3 Artesia. Two more aces by Martinez put the Bulldogs up 12-7 midway through, and a three-point service by Esquibel would take Artesia over the 20-point mark, 21-13. Puentes forced a Coyote side out, and a hit into the net by Roswell made it 21-14. Boyce made that 23 and Morgan Gutierrez 24 with a tip over the net, and Gonzales served up match point on a kill by Kamryn Carrera, 25-16. Puentes and McCombs finished with 12 kills apiece for the Bulldogs and Boyce 11. Martinez had 22 digs and three aces, Riggs 21 digs, and Esquibel and Gonzales 23 and 21 assists respectively. With the win, the Bulldogs improve to 14-4 on the season, 3-1 in district play to take the D4 lead heading into a road match Tuesday against Lovington. 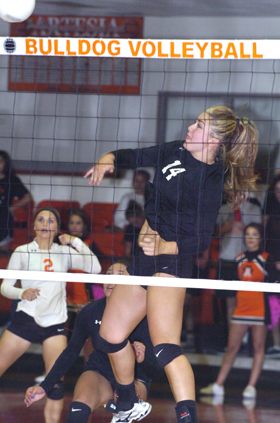 Artesia topped the Wildcats in three Oct. 13 at the Pit.